The Priory of the Orange Tree is a labor of love. As a reader, I could sense so much passion and effort poured into this novel, it is no wonder Samantha Shannon decided to take a break from The Bone Season series in order to birth this one into the world. But let’s first just get this out of the way: clocking in at more than 800 pages, this book certainly measures up to the task, but it also contains all the strengths and weaknesses one might anticipate with such an ambitious undertaking, especially considering we are dealing with the author’s first foray into the epic fantasy genre. The story begins with a prophecy: an ancient evil called the Nameless One, said to be trapped in its abyssal prison, will return to the world after a thousand years of peace. It is written that this evil takes the form of a fire-breathing dragon, which, together with the rest of its fiery brethren, will bring destruction to all of humankind. Because so much history has been lost to time, it is unclear where the Nameless One originated or how it came to be defeated and imprisoned in the first place, but in the West, it is long thought that their legendary hero Galien Berethnet was the one who wielded the sword that grievously wounded the beast. To this day, many in Virtudom, the nation founded by Berethnet, still believe that his ancestors hold the key to the Nameless One’s containment. Legend says that as long as a queen descended from the line of Berethnet sits on the throne, the world will be protected, and so it has been for countless centuries, power passed down to a single daughter in each generation. Currently, the latest in the line is Queen Sabran—young, unwed, and childless, so the pressure is on to arrange a betrothal and conceive a daughter in order to protect her realm. But while the West despises all kinds of dragons, the nations to the East revere them—especially the water-dragons they believe to have been the true reason for the Nameless One’s downfall. As such, they are worshipped as gods, and some individuals even dedicate their entire lives training for the honor of one day getting to ride one. Tané is one of these dragonrider hopefuls, whom we get to meet at the beginning of this novel when she chances upon a Western interloper and fails to report him to the authorities, fearing that it would jeopardize her ambitions. And finally in the South, an entirely different kind of belief system has sprung up around the dragons. Like the West, they have no love for the creatures, but they also don’t believe that it is the line of Berethnet responsible for holding the Nameless One at bay. Still, a Southern order of female mages, called the Priory, has dispatched one of their own to the court of Sabran Berethnet in order to keep an eye on things—just in case. This secret agent of the Priory is Ead Duryan, who has been able to stay closely by the queen’s side all this time by masquerading as one of her ladies-in-waiting. In her undercover role, she has discovered that Sabran is being targeted for assassination. Using her brand of forbidden magic to cast protections around the queen, Ead is determined to ferret out the conspirators before they can put an end to the Berethnet line and possibly bring about the end of the world. 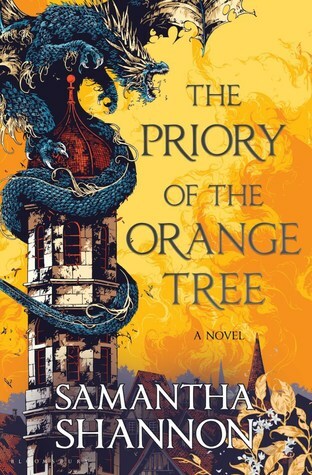 Clearly inspired by the epic fantasy traditions established by authors like George R. R. Martin or Robin Hobb, Samantha Shannon tries her hand at a sprawling, world-spanning saga of myth, dragons, and political intrigue. Rich, riveting world-building compels the reader to stick around and explore further from the very first page. I also liked how this novel incorporated a few touches of real-world elements, drawing heavily from European history and theology for the belief system of Virtudom, for example, or the fact that Eastern attitudes towards water-dragons are a reflection of the way Asian cultures revered the mythological beasts, which they also believed were celestial in nature. This blend of the new and familiar, as well as the author’s grasp of the need of balance between the two, was impressive and masterful. That said, it would be disingenuous to pretend every single page of this massive tome held my attention. With so much world-building and character development to establish, this story takes a long time to find its legs. Even then, it stumbles around awkwardly for some time, jerking the reader’s attention this way and that as this cumbersome multi-thread narrative struggles to get to where it needs to be. What finally sealed the deal for me was the focus on Sabran around a third of the way through the novel, because I thought she was the most interesting character. However, this meant that every time we shifted away from her, it would be uncertain once more whether the other POVs could hold my interest. As much as I appreciated this being a standalone, a part of me also wonders if the story could have been better served as a series of two or three books. There’s enough content here for a trilogy, certainly, and multiple books could have helped this saga achieve its full impact, as there were some ideas in here that felt shallow and unrealized. It also might have stabilized the pacing, because the difference between the slow, measured way information was doled out in the first half of the novel versus the rushed pacing in some of the later sections was quite jarring. Still, the main forces driving The Priory of the Orange Tree are compelling, especially once character motivations are revealed and they become the most important factors fueling the story’s many conflicts. This clashing of beliefs and warring ideologies between East, West, and South eventually comes to a head in a very big way. Just who will win out was a question that kept me glued to the pages and pushing hard towards the end, even through some of the more tedious, meandering sections. All in all, The Priory of the Orange Tree is not a perfect novel, but quite honestly, I did not expect it to be. Although Samantha Shannon already has a few books under her belt, epic fantasy can be a tricky genre riddled with traps and pitfalls for even the most experienced authors. In spite of this, and even given the novel’s flaws, I think she did a marvelous job pulling it all together. Audiobook Comments: I’ve never listened to an audiobook narrated by Liyah Summers, and a quick check on Audible shows The Priory of the Orange Tree is her only credit, as of this writing. I really hope she’ll be scoring more narrating gigs after this, because her performance was excellent. Even with such a long novel, Summers was able to keep her voices and accents consistent, and she brought the story much power and presence with her reading. I’m currently reading this, and loving it! Lovely and in-depth review, Mogsy! 🙂 It’s good to know that despite the initial hiccups, Ms. Shannon manages to hold the reader’s interest due to the rich plot. Thanks for checking out my review! Shannon is undoubtedly very talented, just a few hitches on her first attempt at a very tricky genre! Beautiful review.. IDK why audiobooks never work for me, though I wish it did!! Very informative review! I’ve been struggling to decide whether I should give this book a go or not, but considering most people are semi-positive about it, I probably will give it a chance, albeit at my own slow pace. I’m good with meandering books, and the premise does sound quite compelling: “This clashing of beliefs and warring ideologies between East, West, and South eventually comes to a head in a very big way.” I mean, I’m all for this! I plan on reading this someday but truth be told, I’m in no hurry! I enjoyed your review though and you have me very curious. I tried to read this one and could not get into it. But the premise does sound wonderful so I may have to take another gander at it at some point. I am not in a rush though. Lovely review. I listened to the audio so I found it easier to get into, but I can see the intro being difficult because it’s just so dense with info! I haven’t been loving her Bone Season series either, and honestly I think I had already make up my mind to abandon it. But when I heard about this one, I knew I had to give it a try – I’m glad I did, I definitely like it better! AH yes I didn’t realize that it was a long novel like that, but I saw it a few times and well maybe one day! I figure it’s the hazard of any epic fantasy 🙂 Good thing I’m used to the pattern, I was able to take it in stride, or it might have been more difficult. I know, right? These days all these epic fantasies are trilogies or long running series. I’ve seen the author say multiple times that we should think of PRIORY as three books in one, and having read your review, maybe it would have been better if she had split them up after all. I didn’t have a favorable reaction to THE BONE SEASON, though I was having peak YA burnout at the time, so it may not have been far to the author. Still, I’ve seen a number of uneven reviews (along with a few I LOVED THIS) so maybe her writing just isn’t for me. I understand – this one’s quite the doorstopper! I don’t think I would have done it if I weren’t offered the audio. Yeah, such a long book does demand a fair bit of time investment and commitment. It’s always a risk it doesn’t pay off! Yeah, pacing was wonky, but the good news is that epic fantasy fans should feel right at home, lol! It’s a common enough issue for the genre that I didn’t hold it too much against the book, but yeah 800+ pages is quite demanding! I assumed this was the first of a series when I first saw it. Despite the shortcomings, it’s one I want to try because of the different ways dragons are considered in it, so I’m more drawn to the world building.